Kubica enjoyed a fine 2010 campaign, finishing eighth. 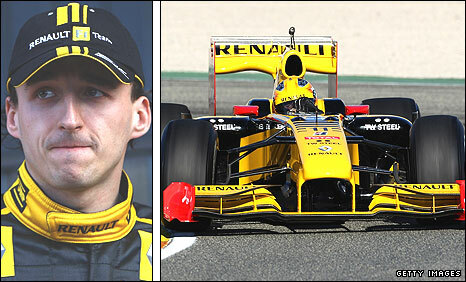 "Robert Kubica had a very good season for Renault. From my point of view, you can now talk about him in the same group as Sebastian Vettel, Fernando Alonso and Lewis Hamilton. "Kubica came second at Melbourne and third in Monaco, but Suzuka stands out as his great qualifying performance. "If I ran a grand prix team, the 25-year-old Pole would definitely be on my shortlist; he's a great driver with a very unusual and slightly loose but effective driving style. "Kubica's consistent race pace and determination mean that his stock is higher than ever. He's doing a great job for Renault, who will struggle to keep him long term." Name three attributes an F1 driver must have? Hard to say. It depends on the day. Probably the busy schedule. ... it's a team sport with a lot of people involved and everything has to work together as well as possible. ... the late Seventies and early Eighties. I don't like to speak about myself so it's better if you ask somebody else that question. I enjoy bowling - I'm not very good though. I also play poker, but I'm not that good either. Lately I've been listening to the Black-Eyed Peas. I don't know the names of the songs though. I don't remember any embarrassing moment in my career so far. I don't know. I don't care. Maybe me, maybe not. Both of them were great drivers. I don't have a preference. Spa has its own climate and its own history. It has a completely different characteristic than Monaco. Monaco is the only real street circuit in Formula 1. If I had to choose I would go for Monaco. If I were not a racing driver at all, I would definitely work in motor sports. If I would not be an F1 driver, I would most probably drive GT cars. There are many great sportsmen - in the past and in the present, but it is pretty hard to compare different sports. I would like to do a long-distance rally stage in Finland with a World Rally Championship car. I have never been to Finland but I would like to go there. I like quiet places where you are on your own. I think Finland offers places like this. I like T-shirts and hooded sweatshirts. It depends on the situation and on my mood but 90% of my time I listen to the radio. Maybe (five-time world rally champion) Sebastien Loeb, maybe (poker player) Gus Hansen. I am a big rally fan and Sebastien Loeb won so many titles. He is the one who could give me advice. I like Gus Hansen's way to play poker. In F1 there are so many media so there is practically nothing about me you cannot find in the media.